A carefully selected bunch of experienced collaborateurs was found to drop beats and bass on the Jazz-Noise of „Music for Drivers“ and to cut and mash it into „Music From Co-Drivers“: Harald“Sack“Ziegler, Noize Creator, Christoph de Babalon, Istari Lasterfahrer, Ashtar DXD, Somtek, Zombieflesheater, Schlammpeitziger, Krube. and Boris Hegenbart aka Rotaphon. All of their common ground is somehow based on Breakcore, Noise, New Wave or Experimental Music. But their musical work ranges from Dubstep and Jungle to Sound Experiments and Cut-ups. Each one of them taking a different and unique approach to remix the Nest`s work. One is using „the depth of sounds only“ for a whole new composition, while the other is blending and skipping through the original album. One piece is a straight dancefloor killer, the next a soulful listening adventure. But finally all leading up to a varied compilation and presentation of possibilities in remixing and experimenting with the original material – in a way The Nest themselves would have never imagined. 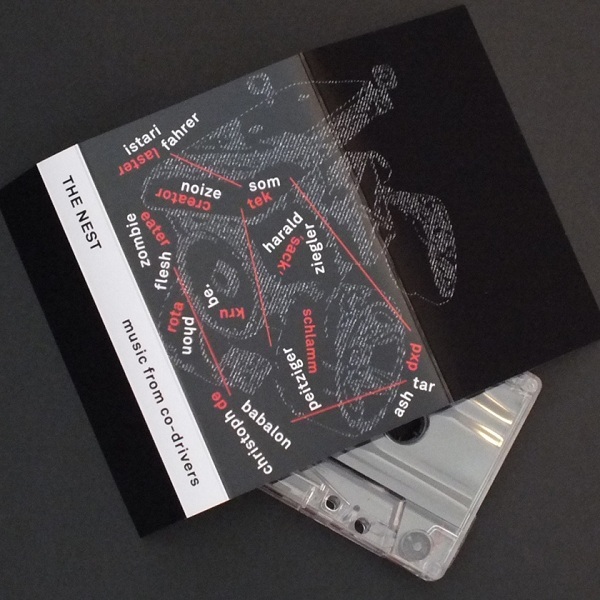 The remix album has been released as a cassette (MC/Digital) in a highly limited box-edition, including a branded USB-key with loads of extra video content, all designed by Cologne based Tausendsassa Jessica Lörs, who has even constructed and built a real „cassette-player-controlled toy car“ for the visual representation of the album.